This project involved an extensive addition to a typical bungalow house in the inner western suburbs of Sydney located on a corner site. In order to fulfill the potential of the site and its relationship to the street the additions were confined to a single level. By doing this the interrelationships between the original house and new internal and external spaces could be maximised. The task was then to create a combination of public and private zones, utilising the house and its elements as mediating devices. The site's relationship to its main street frontage was not previously articulated, and needed to be addressed. The 'breaking' of the original house and new, by means of a new entry courtyard and lower roof element serves to focus this as an area of interplay between old and new, public and private, and reinforce the relationship with the street. The street facade includes both open and closed elements, the courtyard and the two large timber joinery boxes cantilevering beyond the frame of the house which contain storage joinery. These components regulate the degrees of privacy in and out of the house. The use of traditional material such as stucco and brick references the original while rethinking the application, e.g. the brick is translated to the horizontal plane, along the entry path, inlaid into the slab, delineating the internal entry foyer and continuing through to the courtyard. The project seeks to re interpret the existing suburban context and provide a new framework for the client's living needs. 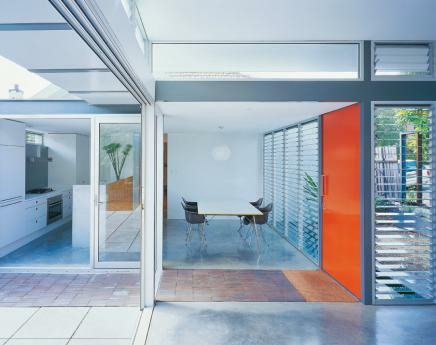 The project received a commendation award from the NSW Chapter of the Royal Australian Institute of Architects in 2005.